Specifically, monetary policy normalization refers to steps to raise the federal funds rate and other short-term interest rates to more normal levels and to reduce the size of the Federal Reserve’s securities holdings and to return them mostly to Treasury securities, so as to promote the Federal Reserve’s statutory mandate of maximum employment and price stability. In short, this is the process of unwinding the Fed's emergency policies of ZIRP (zero interest rate policy) and QE (quantitative easing). 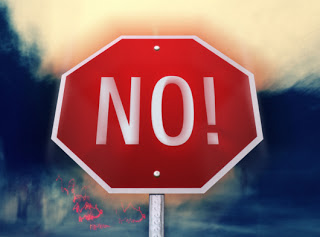 The premise of this post is that the Big No will bring to an end what I call "The Big Mo" -- the momentum trade that has seen the steady rise in the valuations of risk assets that has accompanied the use of unconventional monetary policies. Fed Chair Janet Yellen's speech on March 27, "Normalizing Monetary Policy: Prospects and Perspectives", laid out the FOMC's views on policy rate normalization following the March Fed meeting. 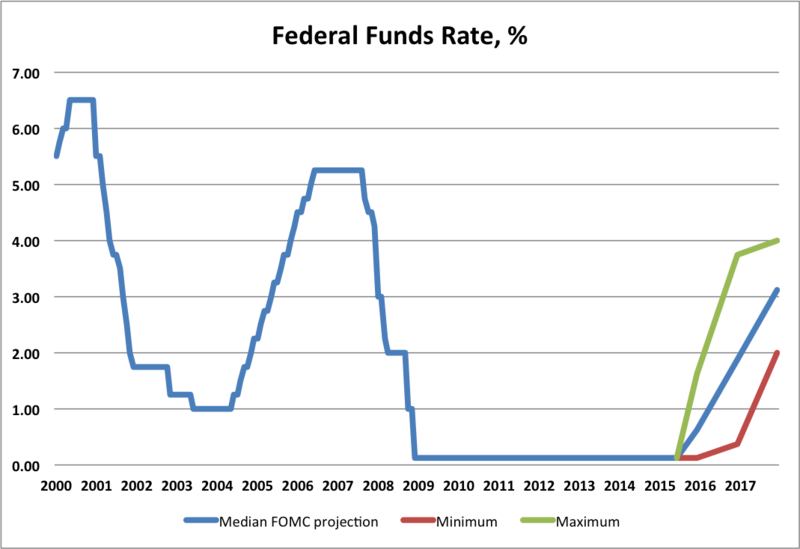 The Summary of Economic Projection (SEP) provided by FOMC members suggested that as the economy continues to improve and move toward meeting the Fed's dual mandate of maximum employment and price stability, the Fed Funds rate will move up as shown in the chart below. the FOMC recognizes that many market participants assess the outlook quite differently. The Survey of Primary Dealers in late January thought there was a 20 percent probability that, after liftoff, the funds rate would fall back to zero sometime at or before late 2017.
there are risks to moving either too slowly or too quickly. The median path projects that the Fed Funds rate will follow a smooth path, rising to 3.25% by the end of 2017. The most optimistic FOMC member projected a rate of 4% by the end of 2017, while the least optimistic projected a rate of 2%. Any one of these scenarios would be a sharp break after six years of the policy rate being pinned down at close to zero. We don’t know — nor does the Fed know — exactly how much tightening will knock over the apple cart. What we do hope the Fed knows, which we don’t know, is how exactly it will fix things if it knocks it over. We hope that they know that before they make a move that could knock over the apple cart. Christine Lagarde of the IMF warned of emerging markets instability as the Fed normalizes monetary policy. The staff of the BIS has warned that given the massive rise in US dollar credit since the Fed launched it unconventional monetary policy, US rate hikes pose a major threat to global financial stability (see here and here). Since the Fed began the pursuit of unconventional monetary policy, asset valuations have risen steadily and volatility in financial markets has been suppressed by the low policy rate and regular injections of central bank liquidity. 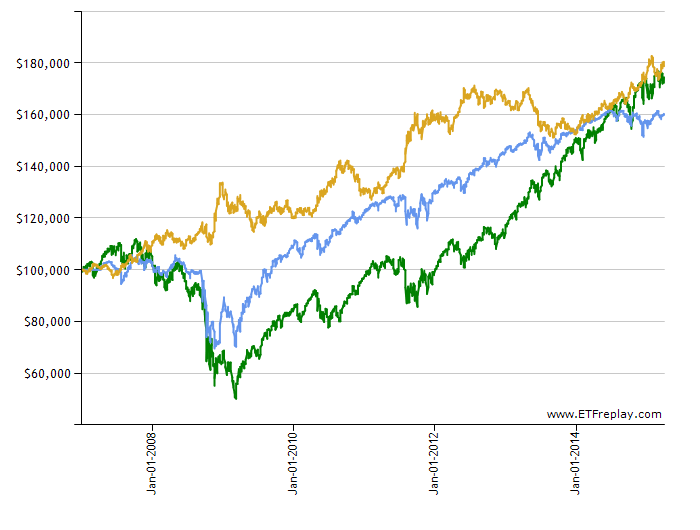 Using ETF total returns, the chart below shows the steady rise in valuations of US equities (SPY, the green line), government bonds (TLH, the yellow line) and high yield credit (HYG, the blue line). Since the Fed went to ZIRP in December 2008, SPY has returned 163% (16.6% per annum), HYG has returned 123% (13.6% p.a.) and TLH has returned 42% (5.7% p.a). During this period, equity valuations, measured by Shiller's Cyclically Adjusted Price Earnings (CAPE) ratio have risen to highs exceeded only in the periods before the 1929 and 2000 market crashes. Bond yields have fallen to record lows, implying bond prices at record highs. And high yield credit spreads have fallen back to pre-GFC lows. As long as markets could anticipate that the Fed would respond to any economic weakness by further easing of monetary policy, asset values continued to rise. Market participants have been paid to stick with the momentum trade -- the Big Mo: long equities, long duration, and long credit. In May 2013, former Fed Chair Bernanke spooked markets by indicating that the Fed would begin to taper its quantitative easing program. Equities, bonds and high yield credit markets all experienced a correction and a rise in volatility -- a "taper tantrum" -- that lasted a few weeks for equities and credit and a few months for bonds. In August 2014, Fed Chair Yellen gave a speech at Jackson Hole that laid the groundwork for the Fed to begin the discussion of policy rate normalization. Once again, equities, bonds and high yield credit markets experienced corrections lasting three to six weeks. With the March 2015 FOMC meeting and Yellen's March 27 speech, the Fed indicated that it expects to begin policy rate normalization later this year, possibly as early as June, and laid out a range of scenarios for the expected policy tightening path. In the wake of this decision, the momentum trade -- the Big Mo -- has shown early signs of breaking down again. So here is the new counter-intuitive conundrum for investors as the Fed moves toward the Big No: sustained solid improvement in the US economy is likely to be bad for all three asset classes that benefitted in the Big Mo trade: equities, bonds and high yield credit. For the Big Mo trade to continue to perform, growth will need to stay mediocre and inflation will need to remain below target. This type of economic outcome will push back policy rate normalization and keep highly accommodative monetary policy in place. That's why the disappointing US employment report for March on Good Friday saw stocks and high yield credit rally when markets reopened on Monday. The soft employment report pushed back the market's assessment of the timing of the beginning of the Big No to September from June. You accurately describe an Orwellian marketplace where good economic news is bad market news. I fear that the longer the Fed accommodates the Big Mo trade, the more disruptive will be its demise. Just rip that bandage off now. When you rip off a bandage, it sometimes gets bloody! You're right: bad analogy. I was trying to say something about not dragging the process out, as that is more painful. What I was really proposing was sooner liftoff but flatter trajectory.